This year's visit to Gibbs Gardens was as spectacular as ever! 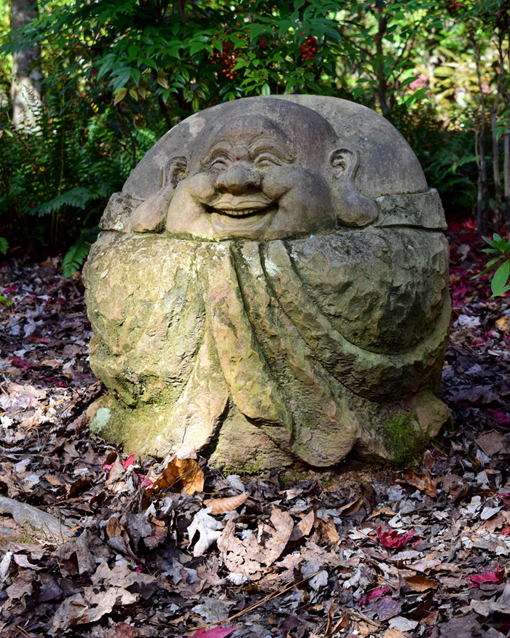 Less than an hour from Atlanta, prepare to be mesmerized year-round by more than 220 acres of display gardens, particularly the beauty in the Japanese Gardens in autumn. On this particular visit, we arrived just before 1:00 p.m. It was lunchtime, so straight to the Arbor Cafe we went! Barry and I both had Jim Gibbs' Favorite Chicken Salad sandwich, served on fresh-baked Cranberry-Walnut Bread. I've had this one before and I guarantee I'll have it again. And again. You can pick up a loaf, or three, of their homemade breads, and even pick it up after your visit on your way home. Visiting Gibbs Gardens during the Japanese Maples ColorFest (previously known as the Japanese Maple Tree Festival) has become an (almost) annual tradition for me, not by design but because of the lure of gorgeous gardens. 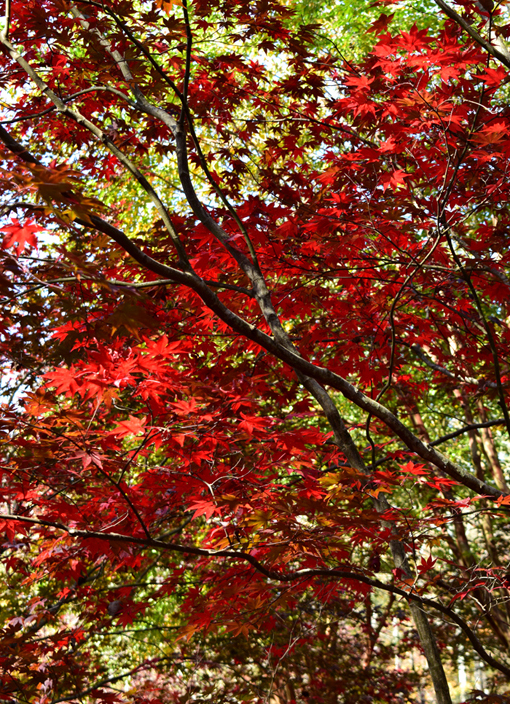 The Japanese Maple ColorFest is celebrated over three weekends, with "peak viewing" determined by the year's weather and weather over those three weeks. Not being a meteorologist or even a frequent weather report watcher, I con only recommend watching Gibbs Gardens' social media channels around the dates noted on their Bloom Calendar. The structures, bridges, statuary, ponds, and more, aren't focal points, but instead emphasize the natural setting and beauty one's experiencing. 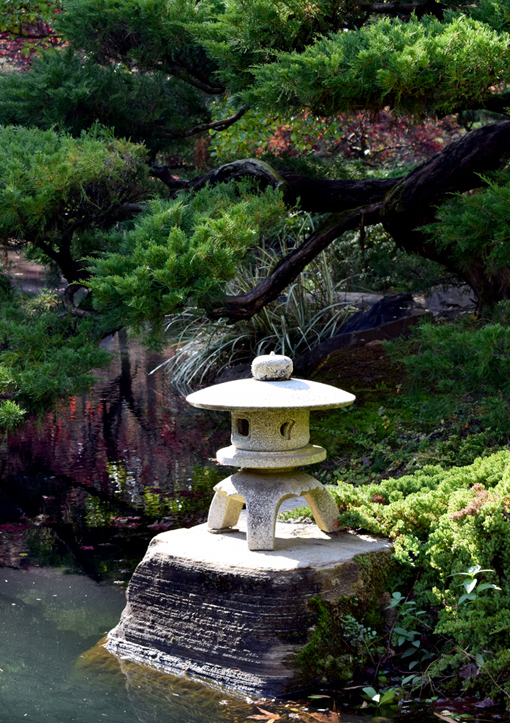 Throughout Gibbs Gardens you'll find 24 ponds, 32 bridge crossings, and 19 waterfalls, many of these in the Japanese Gardens. 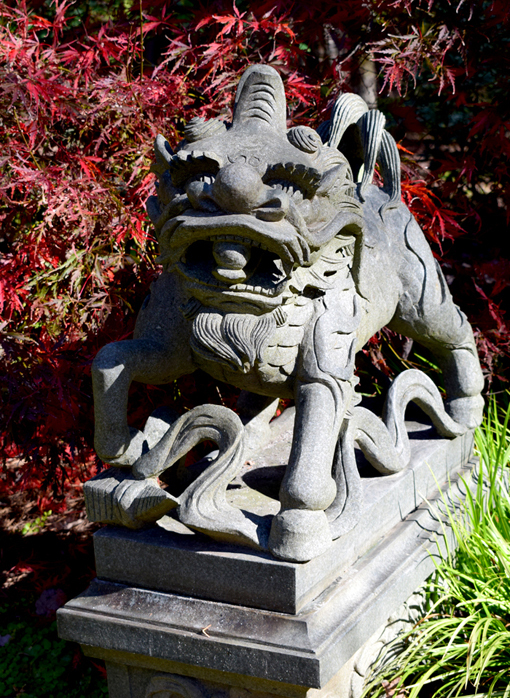 Gibbs Gardens has more than 220 acres of display gardens, their Japanese Gardens being approximately 45 acres! 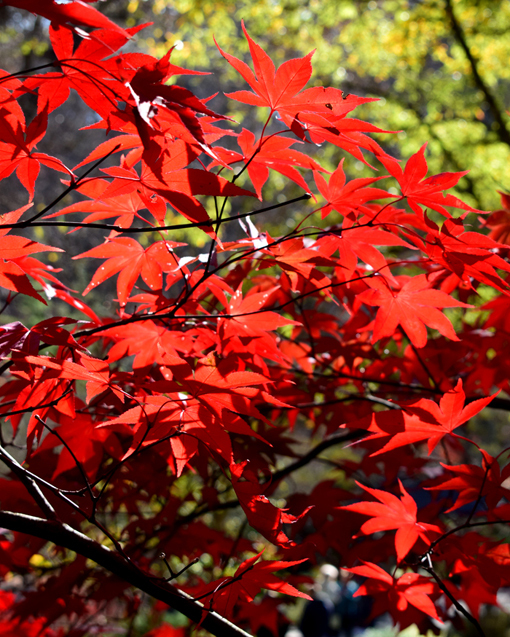 They have thousands of Japanese Maple Trees representing 200 species! 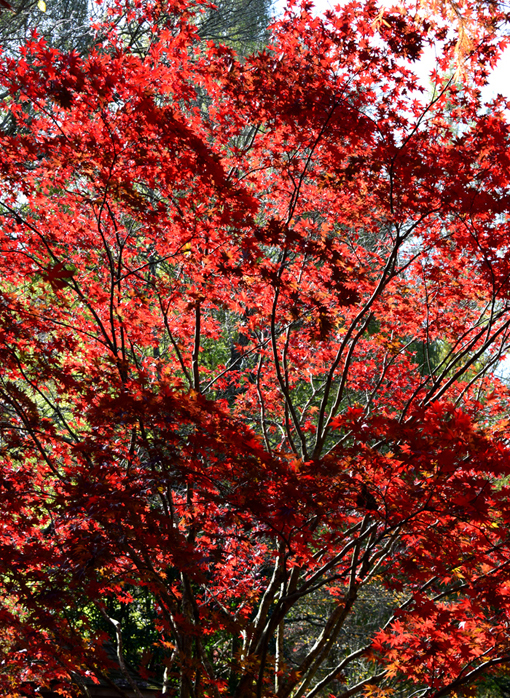 They're beautiful anytime of year, but treat yourself to Japanese Maples ColorFest. There's no other sight like it in Georgia! If you've not yet discovered Gibbs Gardens, I think you'll be thrilled at what you discover there. From the Daffodil Festival in spring—featuring 20 MILLION daffodils—to a a day of playing tourist, there is sight after gorgeous sight to see! If you bring a camera on your visit—and why wouldn't you—be sure to look up, look wide, and look at what the water features are reflecting. Watch for serenity, watch for a breeze, and watch for what you'll be showing all your friends is "the perfect photograph"! This is not one of those places you'll want to say, "You should have been there!" without photographic evidence of why. I've been at least five times in the last four years and I still, quite enthusiastically, bring my camera every visit. I'll cherish these photos for many, many years to come. 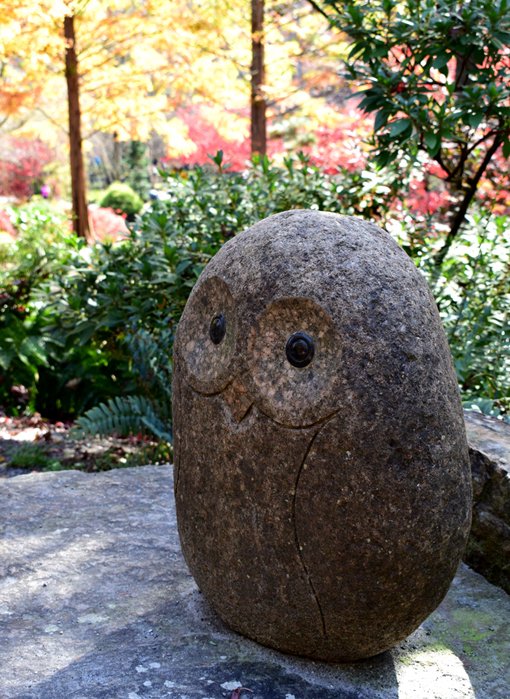 In Japanese culture, my limited research tells me that owls, pronounced fu-ku-rou, are a symbol for "luck" and "no trouble", among other things over the course of history. I've seen them flying in the Rocky Mountains and in ancient artifacts in in Greek museums. Symbology aside, I find owls to be mysterious and elegant. 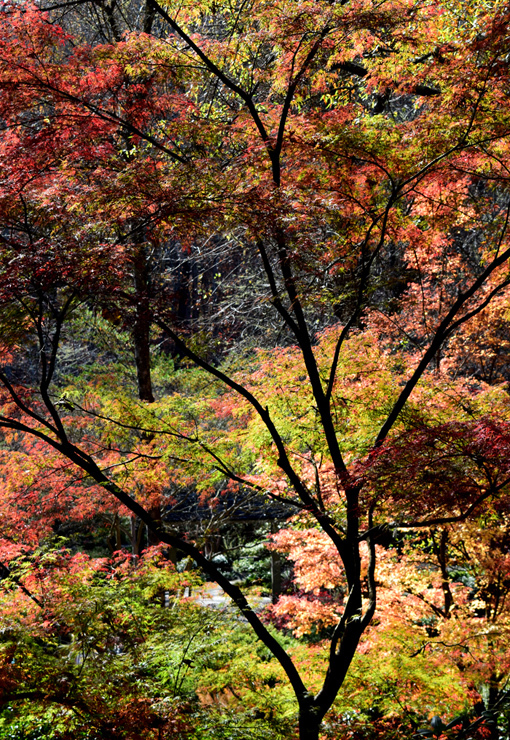 This Japanese Garden isn't just about color—which you can explore for hours on end—it's about nature, as traditional Japanese gardens are. While many Japanese gardens are more monochromatic—green—creating a space for contemplation, I find the same here, even when when not specifically seeking contemplation. I find myself immersed in the exploration for things I might not notice were it not for focusing on the unexpected. You'll find me craning my neck for a unique view or following interesting shapes of the trees, leaves, and shadows...throughout the day. Those shadows and light play is why I highly recommend multiple visits to the Japanese Garden when you're visiting Gibbs Gardens. 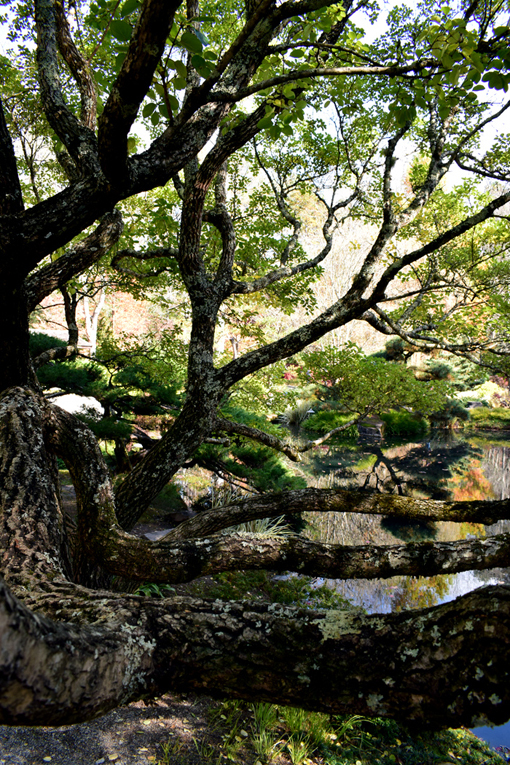 I like to start my visits in the Japanese Gardens and go through again before I leave. No matter how many times you walk through, you're going to see something you'd not seen before. Something you find spectacular! On many days, Jim Gibbs himself is in the Welcome Center talking with guests, answering any questions they have about the gardens, which he spent decades researching and building. Look for him when you visit and so say "Hello"...he's super nice and so grateful to each and every visitor. 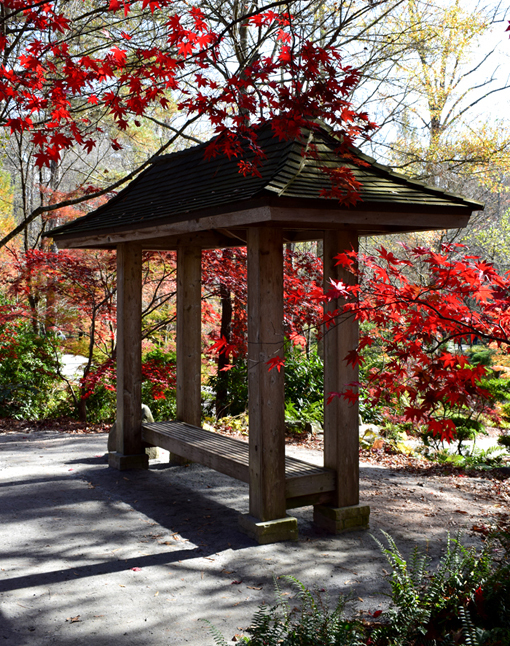 Again, I say, treat yourself to a visit to Gibbs Gardens during the Japanese Maples ColorFest and feast on spectacular fall colors!